We have always had a soft spot for Uffa Fox's Flying Fifteen here at our workshop. 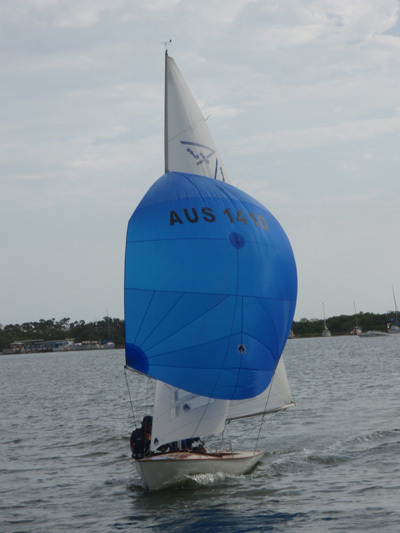 Many years ago Tim crewed at the World Titles Lowestoft England and the Fifteen has been represented in the Gippsland Lakes Yacht Club fleet for just on 50 years. What is not to like about the classic lines and the exhilarating sailing that can be experienced in large One Design fleet racing. During his term as Commodore of GLYC James welcomed a fleet of 38 boats for the State Titles. It was a great regatta held over a long weekend and quite simply, he was smitten. He decided that he had to fly a fifteen. But it had to be an oldie with a wooden deck. 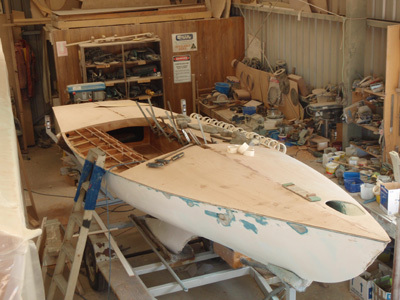 Lots of oldies turned up for sale around the country but one built by Bill Shand in 1970 and fitted out and launched in early 1971 by Peter McAuley popped up in Metung just seven miles away. 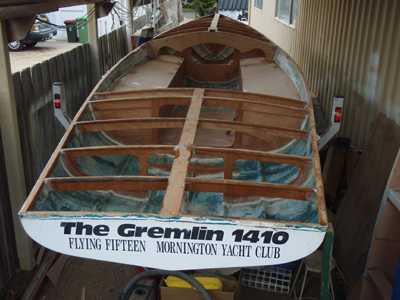 "The Gremlin" wasn't for sale but was in much need of a complete refit. Part ownership was canvassed and with the shake of a hand James became co-owner of a complete wreck. Then the fun began. When the old cedar plywood decking came of the beams came too. A serious ants nest was disturbed and work stopped until that had been sorted. Evidence of some serious altercations on the race track was apparent. The aim was to replicate the original deck but change the deck layout to make boat handling easier. This was to be a modern fifteen on an old hull. Restored when time was available was the plan and everything went according to plan until it was realized that a National Title Regatta was to be held next month in Canberra. Then the fun really began. The boat was relaunched and sailed just once prior to being packed up for the road trip. 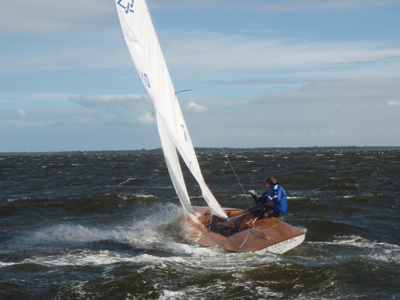 Sails, a flash new set from UK, and the hull and rig were measured on Boxing Day. 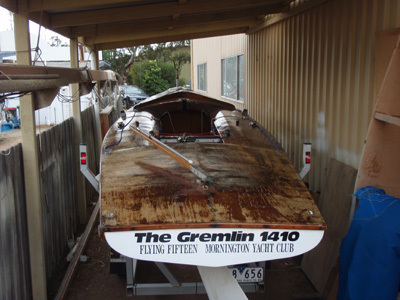 "The Gremlin" arrived in Canberra a couple of hours before the first heat and James and his brother Mark were still sorting things out when the Warning signal was fired. It was an interesting regatta, typical of Canberra with light and flukey conditions. More wind was required, well we have had that since and are reveling the the joy that is flying a Fifteen.